The Regulator has a factory preset fixed static outlet pressure of approx 4.2 Kg/Sq.cm (60 lbs / sqin) and is fitted with safety valve. Once the flowrate has been set, the regulator will automatically maintain a constant flow rate irrespective of changing volume of cylinder contents. 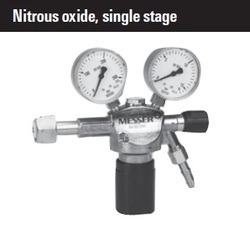 We are a recognized manufacturer and exporter of Single Stage Oxygen and Nitrous Oxide Regulators. These regulators have bright chrome plated forged brass body that ensures long life and corrosion resistance of these products. 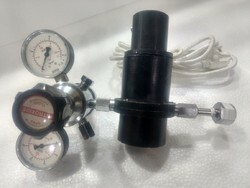 We are also providing O2, N2O Regulator which is used to regulate the flow of the atmospheric gases. These devices are used to control effectively the flow of the gases. Our products are made as per the parameters and specifications laid down by the governing authorities.